She contacted me a couple of days later too, to say that she felt there may well have been a strong spirit message from this Monarch butterfly for me. I was most grateful for that too, because the timing for such a message from spirit for me was perfect. It only goes to prove how we really do grow and learn so much from each other, no matter the nature of our relationship. I was even more surprised when, only a few days later, this special lady phoned to tell me about an experience her son, now in his early twenties had just excitedly phoned her about. Her son, Tyler, is the proud owner of a new rescue puppy. And I believe that little puppy rescued him too! Just prior to phoning his mom, he’d taken the little dog for a walk in a field, and “there were more Monarch butterflies surrounding me than were impossible to count,” he said. 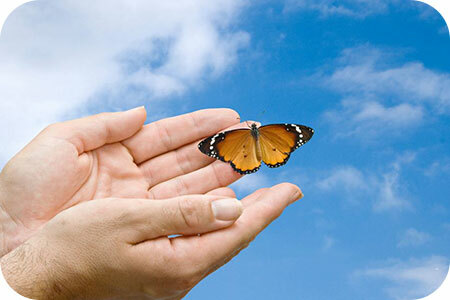 I do feel spirit was very instrumental regarding this sensitive young man seeing these beautiful Monarch butterflies, often renowned as spirit messengers, because he has been through much emotional turmoil and transformation himself recently. Spirit sure must have teamed him and that puppy up too, because chances are, if he was sitting at home, he wouldn’t have seen them in the field either! On the subject of butterflies, just a few months ago, early one evening towards the end of the summer, I was in the pool with my husband, and he gently lifted a large butterfly out of the water and onto the surrounding paving. He said, “It is not likely to live, but I would prefer it dies beneath the warmth of the sun than in this cold water.” What a special gesture that was. And more so when that beautiful butterfly suddenly took flight a few minutes later! I watched in awe as that beautiful little creature took flight. One such little incident can be so exceptional… and for me it truly mattered. Shani,very special to me she is so intuitive and loves her work. I am a terrible mess an I call crying she cry’s with me ,in spirit and I know she listen she is kind an on her list of things she can do you should have a phycologist, nursemaid an friend…..